"How can there be preconditions between Venezuelans? The government has been saying: you are Venezuelan, I am Venezuelan. Let's sit down together. We have our Constitution. Let us sit down and engage in dialogue. 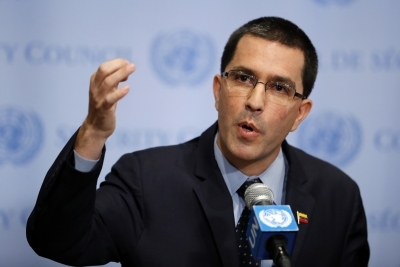 Let us try to find a solution without any kind of strings attached, or any kind of preconditions," Xinhua quoted Arreaza as saying to reporters at the UN headquarters in New York on Tuesday. "This kind of arrogance (by insisting on preconditions) would just hinder dialogue. That's why we say we are waiting for the opposition to get through its pursuit of independence from the US government ... and then we can sit down with the opposition and agree and negotiate in line with the Constitution, and find a Venezuelan solution."